Innovative, eco-friendly and visually engaging, this splendid performance in the night sky receives intense media spotlight, and triggers stronger self-motivation in viewers and spectators to capture those highlights via photos or videos and share them to the social media. The number of “forward/repost” amounted to over 100 million in multiple branding events, easily reaping a RMB10 million-level publicity/promotion return. The contents to be presented via the formation flight can be totally customized based on specific branding requirements. 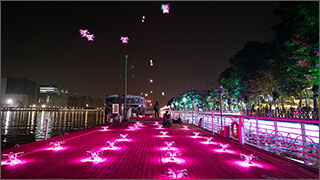 The dynamic variance of drone lights and change of flight positions in a 3D space enable the customized contents to take the shape of different characters or images, forming a fascinating “LED screen” that flies in the night sky. A formation flight performed by over 1,000 drones can be operated by just one person with one computer. This largely differs from the traditional performance method that requires the involvement of drone pilots, making it possible to flexibly adjust the amount of performing drones and significantly reduce the relevant costs. The drones show uses proprietarily-developed GHOSTRONE drones that boasts redundancy design of backup sensors and dedicated real-time communication network to ensure flight safety in different environments. In conform with national laws & regulations, EHANG applies for prior airspace approval and sets up e-fences as protection zones, thus delivering safe, successful and superb drone shows.